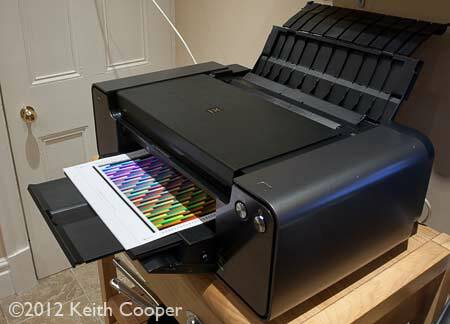 Keith Cooper has been looking at how it performs as a high end photographic printer. Most of this review looks at a Canon PRO-1 driven directly from Photoshop and using an Apple Mac. Functionality is very similar if you were using a Windows PC. 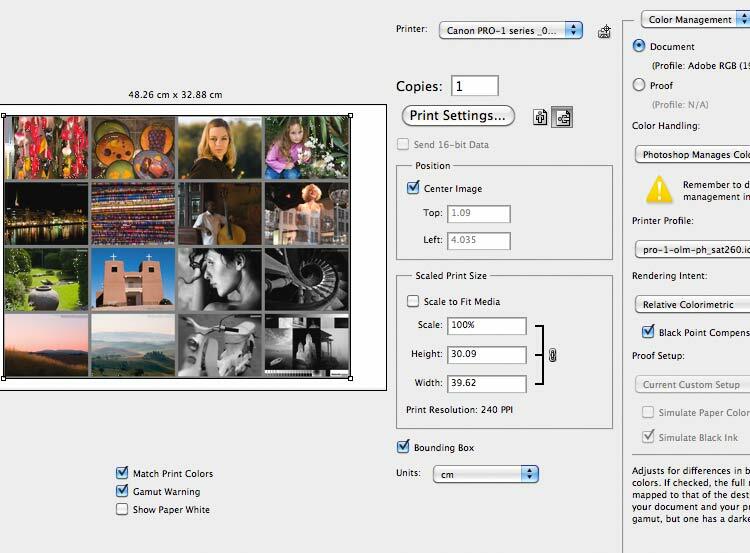 Update: October 2014 – Canon release a firmware update, that increases print area, canvas support and ink level detection. What do you get with the PRO-1? The PRO-1 is a very solidly built printer. The review unit was shipped in a sturdy flight case. I was able to lift it out, but at nearly 30kg you might want two people when shifting it if you’re not too strong. 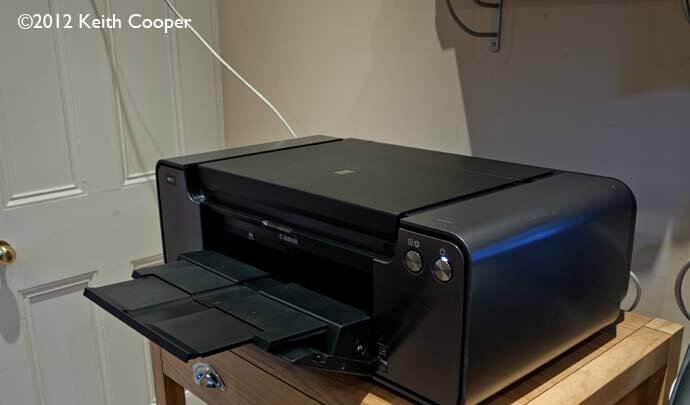 This printer uses quite large ink cartridges, which remain stationary as the print heads move. I’ll delve further into some of these features in the course of the review. The printer is a clean elegant design, with just the two silver buttons on the front, and a button on top to release the cover for the ink carts. Full depth, with the trays out is around 34″ (you need to leave around 7″ from the printer back to the wall. The printer incorporates both USB and Ethernet wired connections – wireless is not an option unless you get an external adapter. 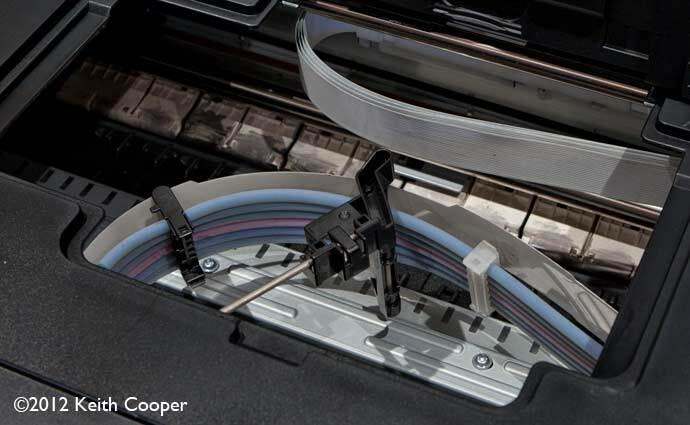 The photo above shows an Ethernet cable coming from our network cupboard, plugged into the back of the printer. After installing the drivers, the printer had no problem in connecting to our network, appearing in two different guises in the list of printers visible. The printer also has a USB socket at the front – this (PictBridge) seems to be aimed at people might want to directly print from their camera. The fact that I’ve never met anyone remotely inclined to do this with a high quality expensive printer, suggests it’s very much a ‘consumer’ feature. 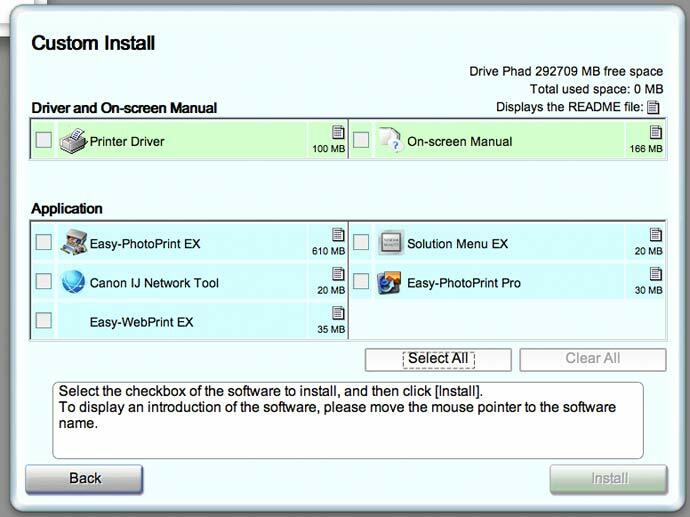 Software is easy to install and gives a variety of options. I’m minded to suggest that anyone interested in print quality will not need more than the driver and the manual. The Network Tool may be of interest to some, but the other print options would not I suspect feature highly in most people’s use. Given that the printer was shipped in a working state, I didn’t need to install the print head (new printer hardware setup takes about 40 minutes, allowing for the printer to do all its ink charging after loading cartridges and the head). The print head just drops into place and is locked in – this happens through the top access panel. Instructions are clear, and it really isn’t a tricky job. Just remember not to touch the actual print nozzle area or the electrical connections to the head. The print head will need replacement at some point in the future, but based on experience with other Canon printers, that shouldn’t be for many thousands of prints. Ink levels can be checked a number of ways. As you can see, there are a lot of colours. As with other Canon printers, I have a personal dislike of the level of granularity in their ink level displays – there just aren’t enough levels. 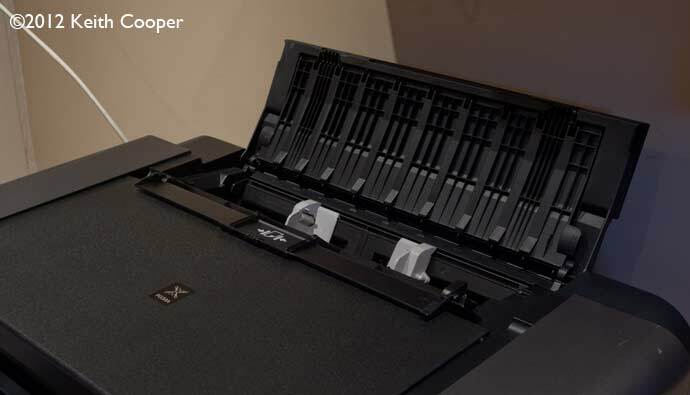 The ink system splits the carts either side of the printer. 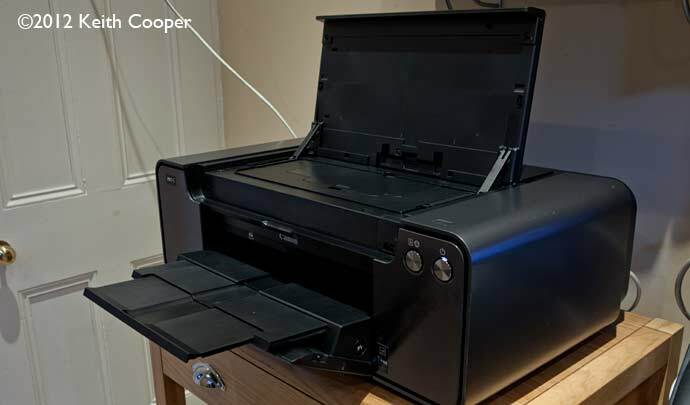 With the ink lines and sub ink tank to be charged, expect a noticeable (20-30%) drop in levels when setting up a brand new printer. 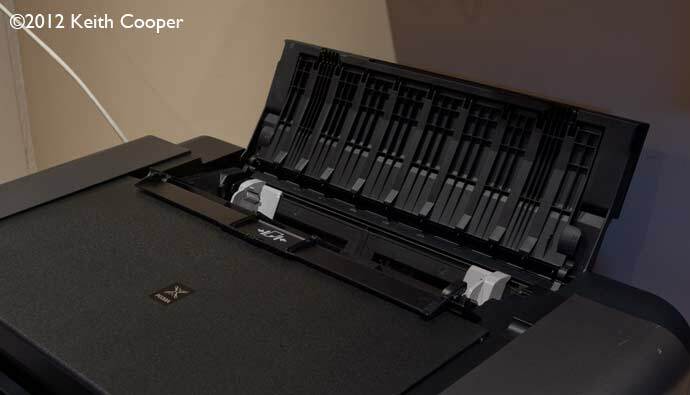 If you lift the lid, and then the access panel, there is limited access to the inside of the printer. In fact it took three A3+ prints for levels to drop, and a low ink warning to appear. In fact it took some 20-30 more prints and some cleaning, before the matte black ran out. 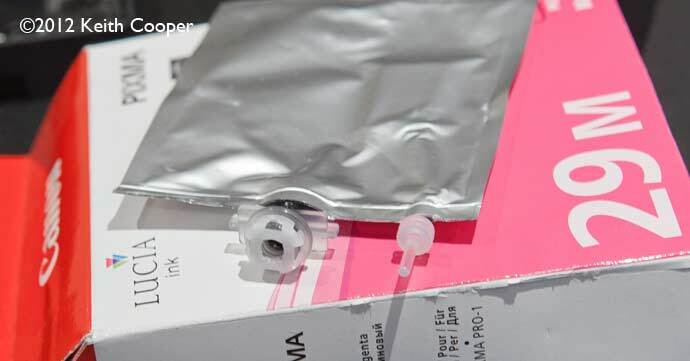 This is the ink bag inside the cartridge. Wondering what that plastic pin was, I opened the bag. You can also see the cartridge’s data chip connections in the corner. When pigment inks became popular some years ago, one problem was with black, giving rise to the need for matte black ‘mk’ and Photo black ‘pk’ inks for different papers. Indeed, this need to swap used to be a major issue for people like myself who might want to print on a variety of paper types. With printers such as the PRO-1 (and our own large format Canon 8300) there is no swap or delay in switching inks – both blacks are loaded all the while. 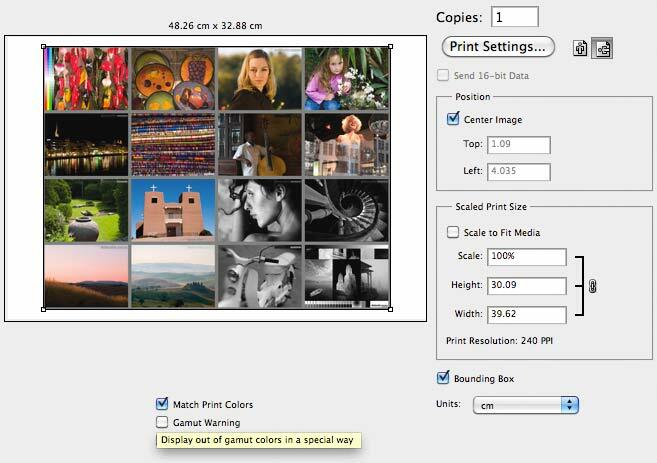 The black ink type is automatically selected by your media choice when printing. One ‘ink’ that our 12 colour iPF8300 doesn’t include, is the clear colour optimiser coat. This is a clear overcoating that as this (Canon) graphic shows, is meant to even up surface reflection from the droplets of ink sitting on the surface. Don’t expect a perfect smooth finish, this isn’t like a smooth varnish coat. These examples from a B&W print on lustre finish paper show the sort of improvement you can expect. I’ve had to take quite some care to show this effect with light from ceiling halogen lights. It is not normally a problem. First a B&W solid white part of the image doesn’t reflect in the same way as the ink surface. Secondly, with the gloss coat, still some differential, but much more difficult to show. The colours are partly from the lighting, and much more obvious in these images than to the eye. 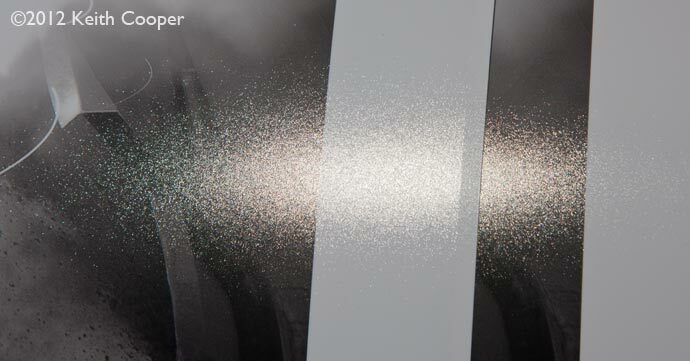 The coating is only available for some media types, and can be applied in an automatic mode, where it depends on the image content, or as clear coat to the whole printable paper area. 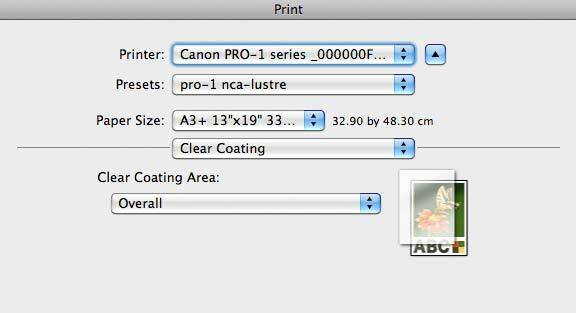 Note: When printing via our Macs, I try and set up print settings ‘presets’, so as to be sure I’m always using the same settings during tests. Note how the coating doesn’t quite go to the edge of the top sheet of paper. The printer supports a lot of paper sizes, including borderless printing on some paper types. I’ve selected paper sizes from the dropdown list in the print dialogue. Note that different papers need different settings and may need a different feed source. Paper can be stacked in the rear feed tray – I had no problems with twenty sheets of A4 photo paper, of 5 sheets of the A3 lustre finish paper shown below. A bit more space is needed at the back. 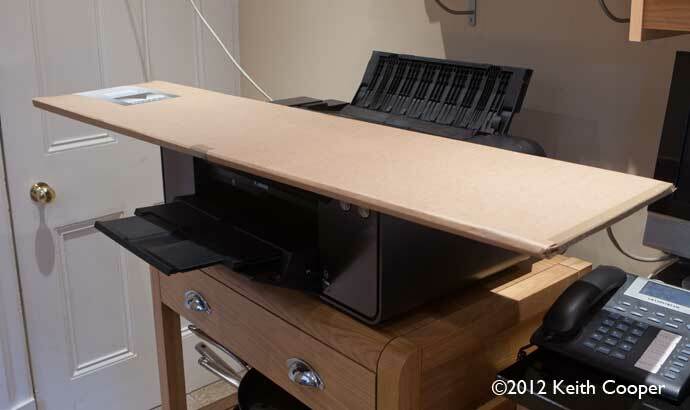 A very useful solution if you want to do a few wide prints. BUT… there are important page size limits, which I’ll cover later when looking at some of the printer’s less welcome features. The CD loading tray lives under the massive top cover, unfortunately it had been lost for this printer, so I unfortunately wasn’t able to test print quality. 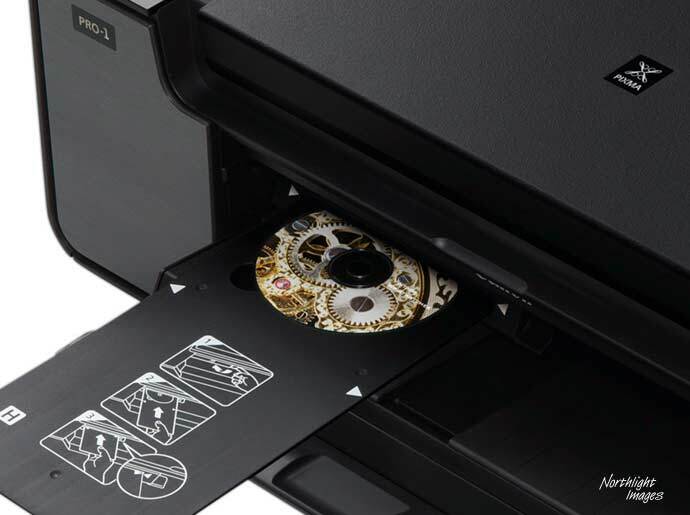 The holder slides in at the front, to print on your disk. That doesn’t mean there aren’t differences, it’s just that the images that clearly show them are getting (much) more difficult to find. I’ve made custom ICC profiles for all non-Canon media I’ve tested, and noticed, even when printing test targets that the printer is very linear. I’ve more about this in the section covering profiling and colour management. I’m printing directly from Photoshop (CS5 in this instance) with a range of images I know well, and that have features in them that push different aspects of printer performance, such as the intense colours in this Aspen tree (up around 9,000 feet in Colorado). The printer showed no problems with the deep saturated colours that give detail and depth to the tree. An A4 image with text, shows very crisp detail whether at normal high quality, or the (noticeably slower) highest quality. With both print modes I’ll be honest and say that the next morning I could not readily tell the two modes apart without getting my pocket microscope out (if you’re testing this for yourself, be honest, and try and do a proper blind test). 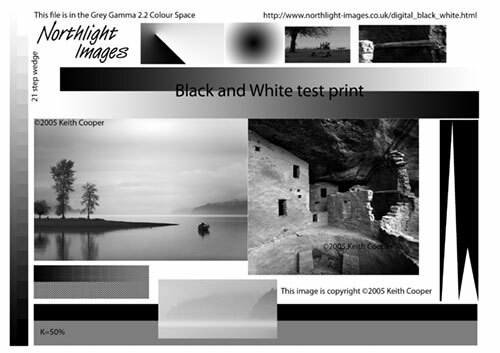 For black and white, I used the printer’s monochrome mode, where you use the printer driver settings to specify B&W. 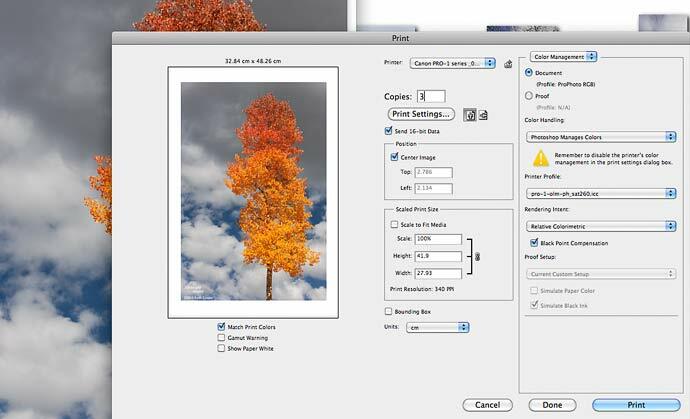 In the driver settings, you can alter some settings and fine tune the tonality of your print. As with our iPF8300, I noticed a slight tendency towards prints looking magenta, under dim incandescent lighting. I’ve looked at this elsewhere, and as with our 8300, found that slightly increasing the Y value in the dialog box below to +3 completely eliminated this. This effect does vary with paper type, and no adjustment was warranted for any of the matte art papers I tried. Since I get quite a few printers sent here for testing, I’m always wary of ascribing any problems to the printer, rather than the somewhat rough handling they may have experienced getting here. Indeed, the printer took many minutes whirring away when it was first started up. As I’ve pointed out, there was ample evidence of internal ink spillage, so I looked at cleaning ink rollers and the bottom plate of the print mechanism. 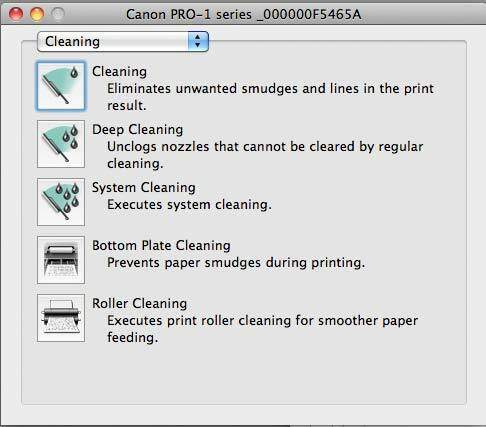 Fortunately, the printer utility offers a number of cleaning options beyond the normal head cleaning you see. Do note though that running the ‘System Cleaning’ option is going to run down your ink levels quite appreciably. In all the time I was using the printer, there was no sign of any print head clogging issues. Some of the cleaning needs you to prepare paper to use for cleaning. The sheet below is after the second cleaning attempt. Having made profiles for many different printers, there is often a certain subjective ‘look’ to profiling targets that tells you how well the printer will profile, with a particular paper. The test sheets out of the PRO-1 were some of the most linear I’ve seen in a desktop printer, with clear gradations in tone and a wide range of colours. I decided to profile some third party papers and also look at the supplied Canon profiles for their own media. This was with a good quality lustre paper that I’d regularly use with our iPF 8300 44″ width printer (which has essentially the same ink set, but with green and blue ink rather than the extra grey and ‘colour optimiser’. 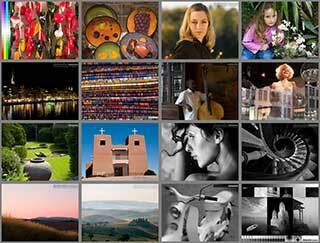 Eminently capable of producing real world images in suitably vivid colour. On a par with other advanced pigment ink sets you may come across. Indeed, fine gradations of tone in some areas of prints were exceptionally smooth. I’d note that my own i1Profiler based profiles benefited from applying BPC (black point compensation) when printing in relative colorimetric mode. 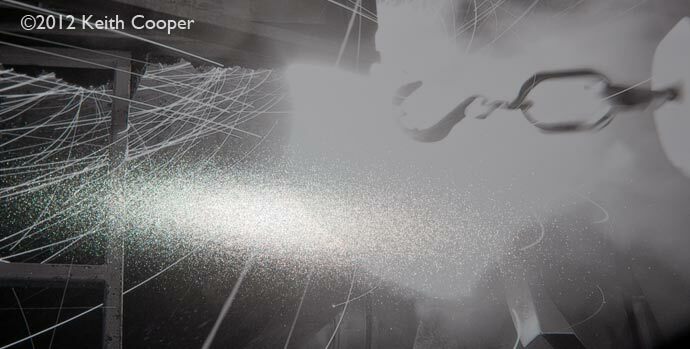 Move you mouse over the image to see the difference in the gamut warnings and soft proof. This is pretty much what I’d expect given the media and profiling settings. The software I’m using is what most people who would make custom profiles for you would be using, even if they are less likely to use the ~2900 patch targets I prefer. 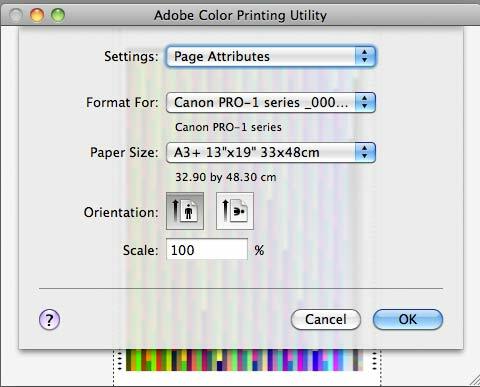 However, if you look at the supplied Canon paper profiles, an interesting difference is visible. The image on the left was printed (actually on Canon Matte Photo Paper) without BPC and the more washed out one on the right with BPC. I’m left wondering if some of the reviews questioning the quality of the supplied Canon profiles, fully investigated the range of printing settings? Where I tried some other Canon papers, the profiles were more than adequate (I’d probably be able to improve on them, but whether many could tell, wasn’t clear). Several Canon profiles come in different versions, seemingly optimised for speed and quality – I couldn’t really see any problem with either, but the explanations in the manual could do with more clarity . Canon actually have listed quite a range of profiles available for this printer, and Innova, one of my regular UK paper suppliers, have a range of profiles for their media. My profiling targets were printed using the Adobe Color Printing Utility to ensure that I was getting them printed correctly without any hidden colour management being applied. 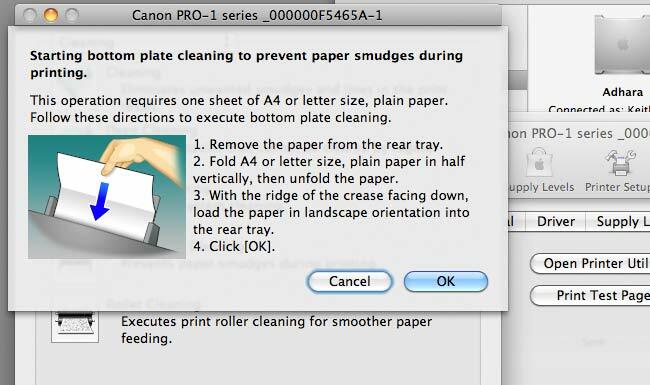 This has been a problem in the past with some print set-ups. 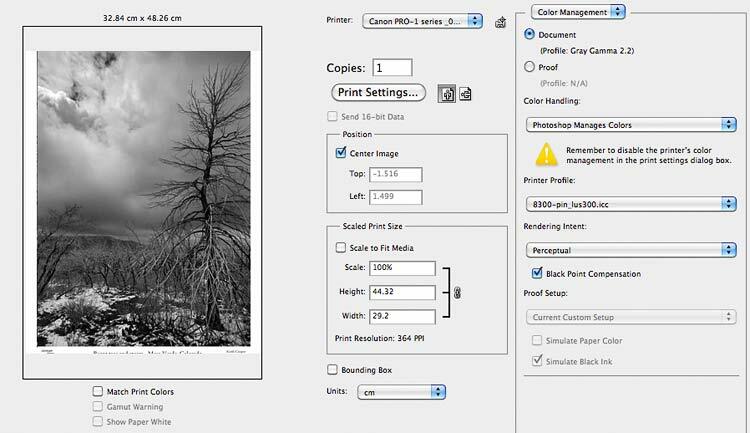 Canon printers like this one have a specialist black and white print mode. 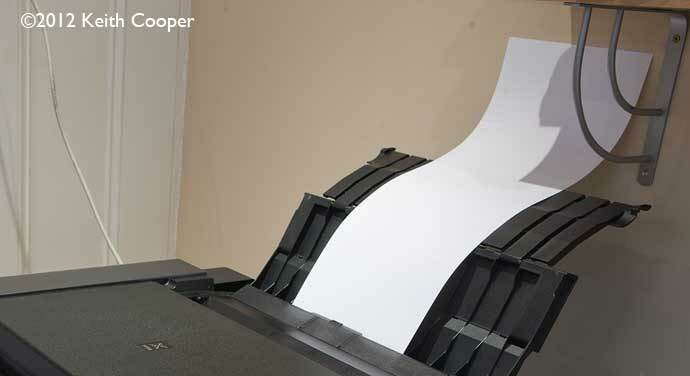 You just choose it in the driver and you can print good neutral black and white prints with no further adjustment. If you’re using a third party paper, then you need to choose a media setting that approximates the type of paper you’re using. It looked quite good, but I suspected that the shadows were a little blocked up. 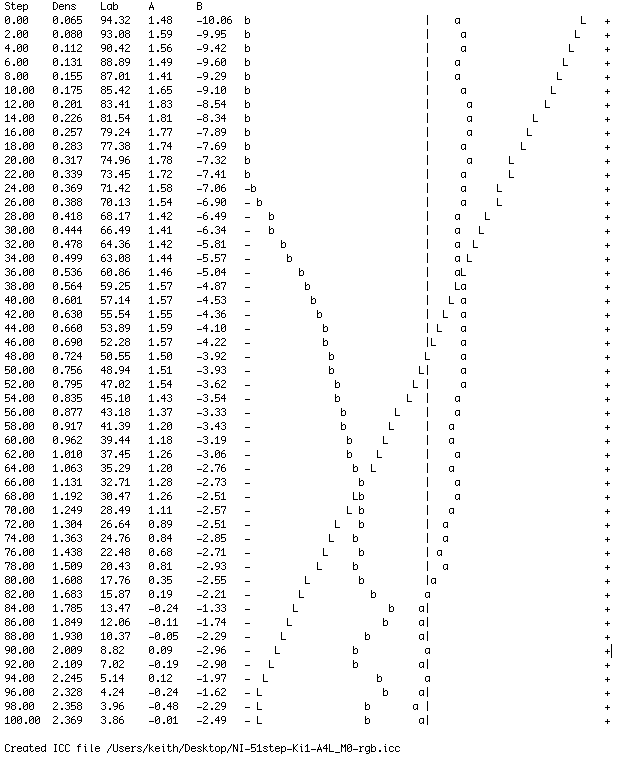 It’s actually quite straight and only has that flat bit from 96-100% which does indeed indicate crunched deep shadows. Making a QTR profile to correct this produced an almost completely linear output and a perceptibly better print of the test image. Note too, the slight wobbles in the ‘a’ and ‘b’ lines. 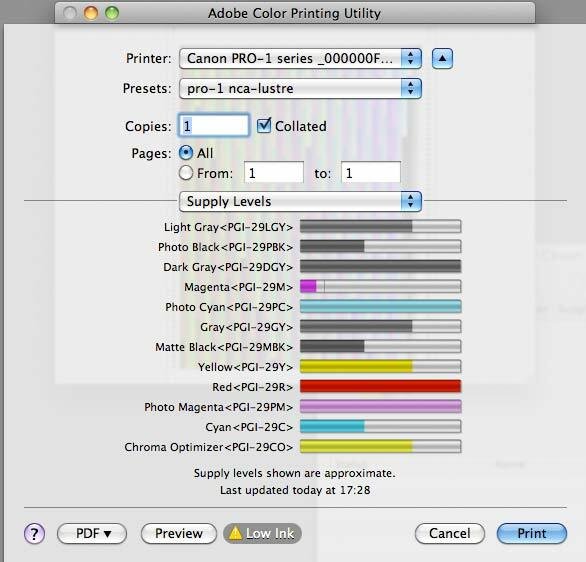 These show where different inks are being used for different densities of printing. Following this, I tested some Canon art papers, and although a correction profile could be seen to have some effect, print non-linearities with papers such as museum etching and photo rag were pretty minimal, and at that level where I might not even bother to use them. With all those black inks to choose from, you might expect that only the black inks were in use. An actual check of printed test images shows the presence of yellow, cyan and magenta in the mix. The three images below were taken with our MP-E65 macro lens at x5 on a 1Ds3, lit with an MT-24EX flash. 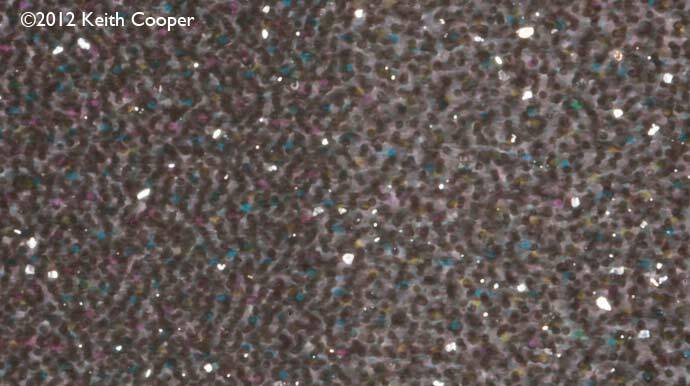 The paper was the lustre finish one measured above (the white specks are dust on the print, black specks are sensor dust). 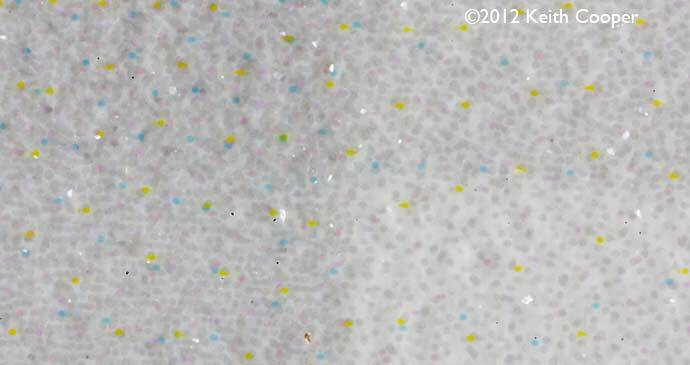 Light printed area (~15%) mostly cyan and yellow dots, with a few light magenta. Medium (~50%) mostly cyan and yellow dots. Dark (~80%) – a few more magenta dots are visible. These colours could be introduced either to counteract any warmth of the pigment blacks/greys or even to better match the greyscale of the paper to the paper white. A personal view ;-) … Some may be concerned at the appearance of colour inks, when considering print longevity, but I’m of the opinion that if this matters to you that much, why haven’t you got a large format printer with a black only ink set, or driven by software such as true black and white. 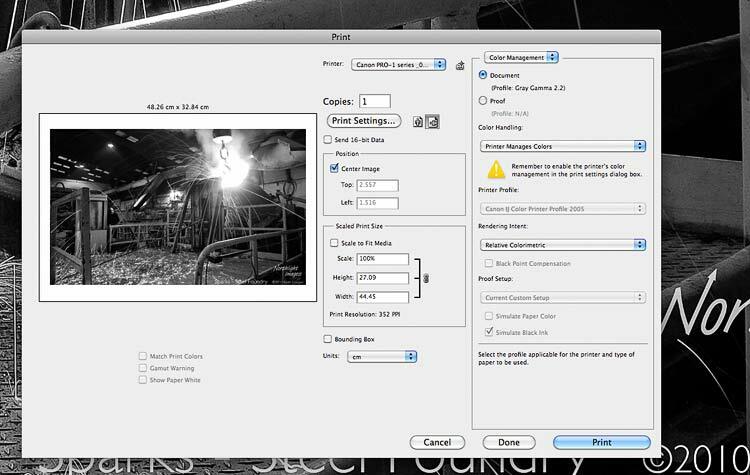 I regularly use Canon’s print plugin to drive our iPF8300. It’s robust, simple, effective and very easy to use. I’d hoped that this approach might appear in the PRO-1 software. You can see two Canon tools in the Photoshop ‘Automate’ menu below. 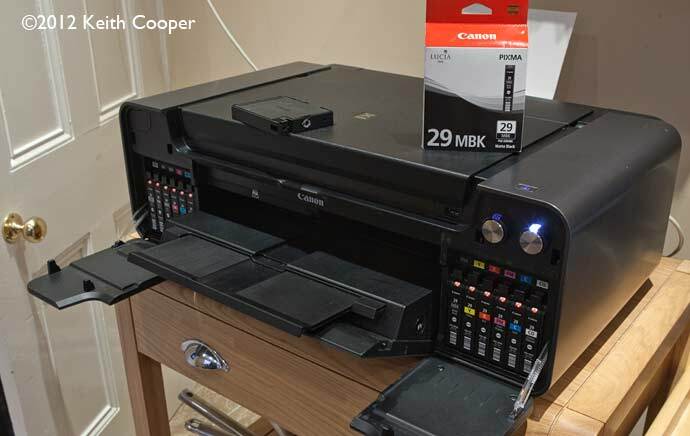 However, I forgot that despite its marketing as a ‘professional’ printer, this printer comes from the consumer division of Canon. 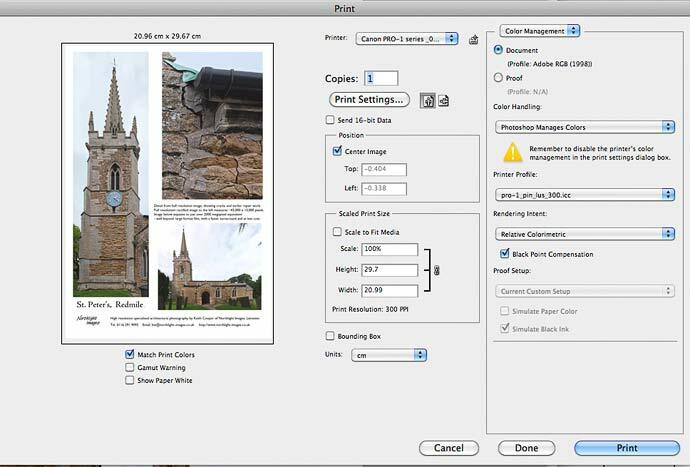 Suddenly we get all kinds of whistles and bells added to a print application, right from image selection options. This is a bit of a mess from a usability point of view. All I wanted to do was print the image I have open in Photoshop. Canon can get it right, their plugin works just fine with my iPF8300. Why not produce a similar basic print plugin for the PRO-1? I see the hand of consumer marketing in the PRO-1, not quite prepared to embrace the product as for ‘professional’ use and coming up with overly complex solutions for consumers and irritatingly complex ones for advanced users. 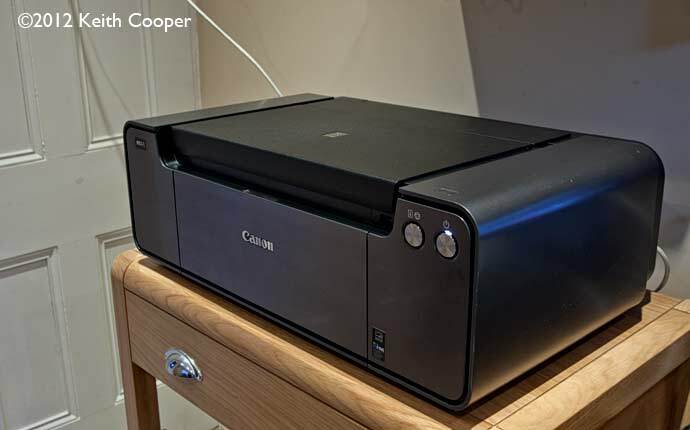 If Canon do release a bigger version of this printer, to replace the iPF5100 for example, then I sincerely hope they follow the software directions found in their large format printers rather than the mish-mash here. This isn’t just my own dislike of what they’ve produced, but also an appreciation that the plugins (such as I use with our 8300) may actually contain tweaks and improvements to print quality, compared to just using the normal Photoshop print dialog. That said, do have a look at what the supplied software does, there may be a function hidden in their somewhere that is just what you need (such as some of the layout options you can see above). 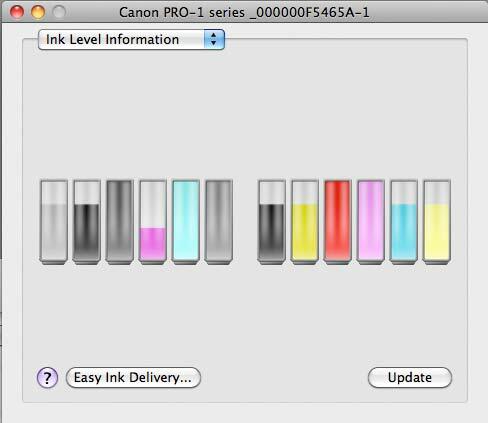 The Canon Colour Management Tool Pro is a standalone bit of software which allows for calibration and ICC profile creation. It works with X-rite spectrophotometers, including i1 Pro, i1 Pro with UV Cutoff filter, ColourMunki Photo and ColourMunki Design. There is no support for the iSis or i1Pro 2 as far as I can see. 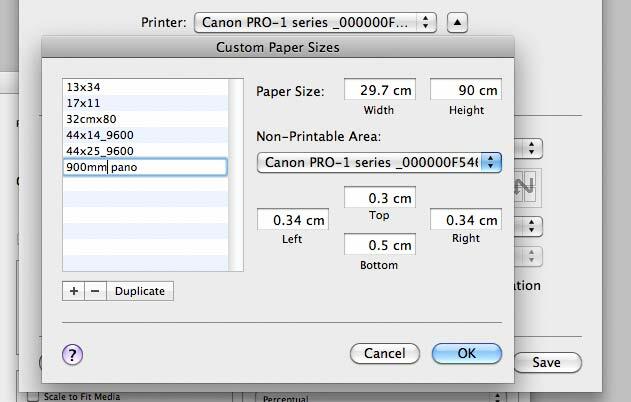 Obviously, it’s designed to work with a Canon printer, which it does perfectly well. An optional measuring instrument is required for measuring the color differences to use Color Management Tool Pro. You have to install the software that came with your measuring instrument before installing the driver for the ColorMunki series or the i1 series. With the i1 Series, the calibration base plate, the chart measuring ruler, and the measurement backup board are required in addition to the measuring instrument. The i1 Series supports both i1 Pro and i1 Pro2. Let’s get one thing clear, this printer can produce excellent looking prints. 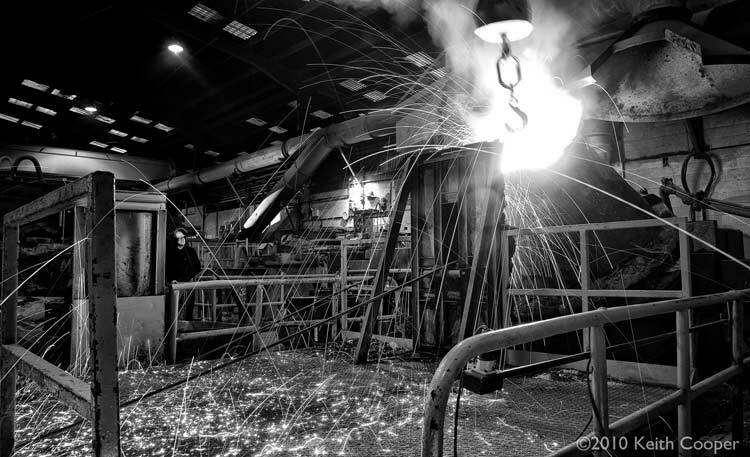 Colour and black and white images produced prints I’d be more than happy to put my name to. Right from initial printer profiling, the attention to print quality is clear, and the gloss coat adds a visible improvement to prints on some glossier surface papers. The supplied Canon paper ICC profiles produced acceptable results, and in terms of building custom profiles, the printer was extremely easy to profile. Do note though, the differences I observed when choosing BPC options when printing. This is a printer though that will likely benefit from getting custom profiles created. For black and white printing, results ‘out of the box’ were generally acceptable, but could in many cases be slightly improved with the creation of linearising profiles. Print speed varies with quality settings and print area, but A3+ colour prints at normal resolution came out in less than three minutes (notably faster than the previous 9500 mk2 I looked at). Highest quality settings took a lot longer and to my mind were not generally worth the extra wait, since differences in visible image quality were minimal. I’m of the opinion that printing images with higher PPI settings (400 or even 600 if the resolution is there) along with careful attention to print sharpening (i.e. not just hitting the ‘sharpen for print’ button) will more readily improve your visible print quality than going for the slower and more ink thirsty ‘highest quality’ settings. The printer also happens to be one of the quietest I’ve tested. The printer driver worked just fine via Photoshop. The supplied additional print software just tried to do too much – I can see that tools such as the layout options may be of use, but overall the software just didn’t feel like something I wanted to make the effort to learn (but do have a look at it, it might do just what you want). 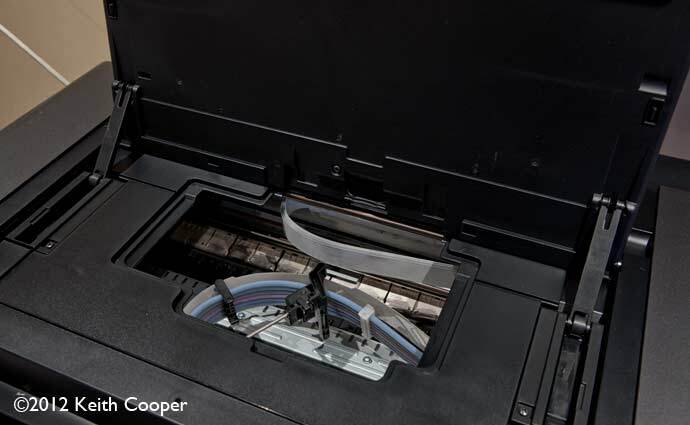 After power up, the printer takes a minute or so to get itself ready – not as long as our large format 8300, but longer than the office printer. 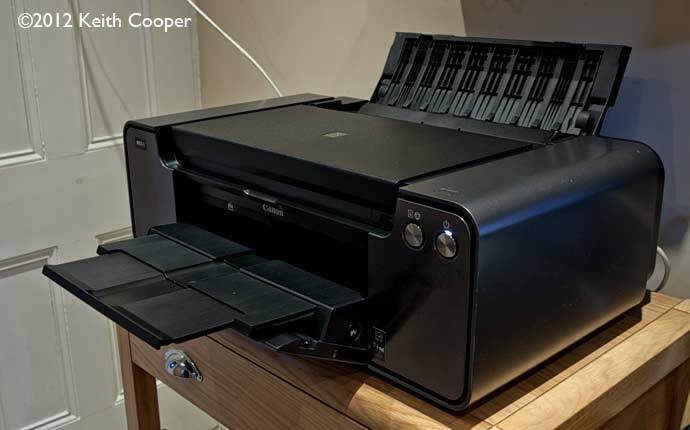 The styling of the printer is quite striking, with just two buttons on the front. No LCD display for example. Initially I thought this was just fine, since why did I need a complex interface when I could do everything from the laptop next to it. It was when I was driving the printer from the Mac in my office, for a manual feed print, that I realised how little use a single flashing light was in working out what I might have done wrong. After a couple of weeks use I started resenting the need to walk away from the printer to find out what it wanted to tell me to do. The lack of LCD screen is obviously a key design decision for this printer, one that after a while I’m not so sure about. When I looked at the Canon 9500 Mk2 printer, the biggest issue for me was the huge top and bottom margins imposed on some media types. Unfortunately this feature persists into the PRO-1. 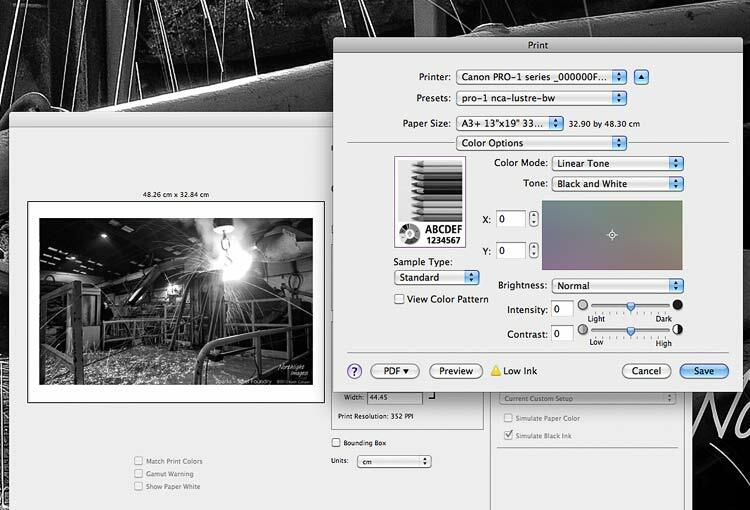 Given that I like printing some of my B&W images on cotton rag papers, the mandatory 35mm margins are most unwelcome. Look at how much of the page below is truncated on an A3 sized print – it makes printing on small paper sizes (say cards) completely impractical, if you use good quality art paper. You might think that you can get round this with judicious setting of custom paper sizes, but no, that margin is set in firmware. The only way round it is to print with a different media setting, but of course this invalidates profiles and potentially makes it difficult to get good quality ones, even if you make them yourself. 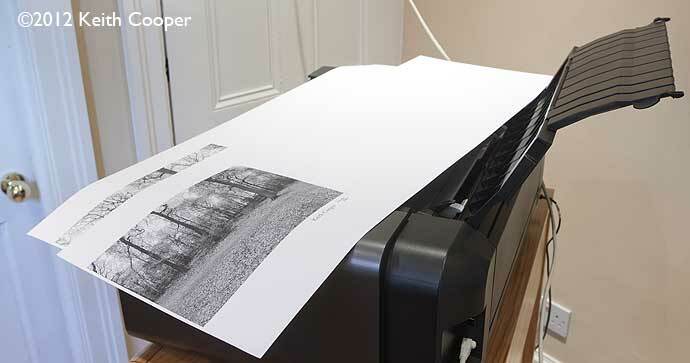 The printer has no roll paper support, so if you want to make panoramic prints, you might think of a specialist paper, such as the panoramic paper sizes I was looking at, from Paper Spectrum (a local supplier within cycling distance). The picture below shows a box of 297mm x 900mm (panoramic A3) that I was going to try out. I’d successfully printed a 210mm x 594mm with a custom page size. 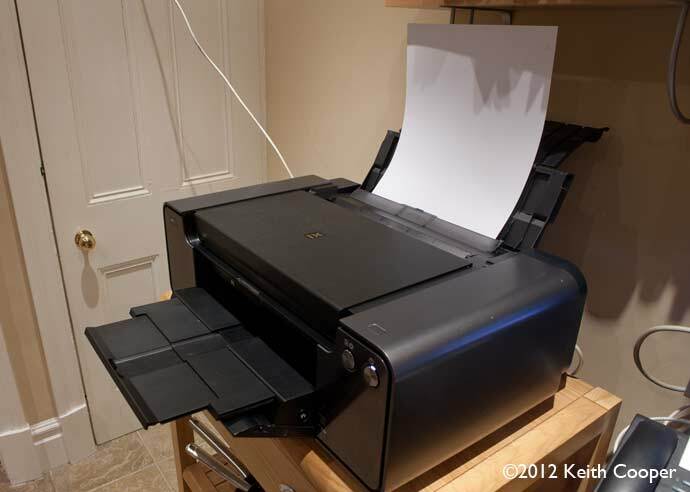 Then I looked in the manual (something I get less and less keen to do, the more printers I test). There it is, clear to see. A maximum page length of just over 26 inches. Yes, really… 26 inches. Looking at how the paper actually fed perfectly well through the printer, I’ve no doubt that the mechanism is quite capable of handling the 900mm (~36 inches) paper, but someone somewhere would rather you bought a larger printer to do it. The sheets of A4 lustre photo paper below, have just been taken out of a new box. As you can see, there is a very slight curl. This was enough to leave head strike marks at the start and end of every sheet printed. Even after various cleaning methods (outlined earlier) there were still small marks (enough to render the print unacceptable for commercial sale). Exerting a bit of pressure against the curl (using the curved edge of the printer) was enough to get the sheets quite flat, but still elicited some strike marks. How much of this is due to the printer being damaged in transit, I cannot say, but the printer does seem rather intolerant of any curl in media at the top and boom of a sheet. We make a specific point of not selling hardware, but if you found the review of help please consider buying the PR-1, or any other items at all, via our link with Amazon. If there is one area that regularly appears in on-line discussions of printers of this size, it’s how much ink they use. >I must preface this part of the discussion by saying that although I printed a fair few pictures, I was starting with a used printer, with partly filled ink carts, and didn’t have nearly enough spare ink carts to test this in a rigorous methodical manner. Let’s just take Canon’s figures for A3+ paper and colour photos. * Estimated supplemental yieldInk yield may vary depending on texts/photos printed, applications software used, print mode and type of paper used. 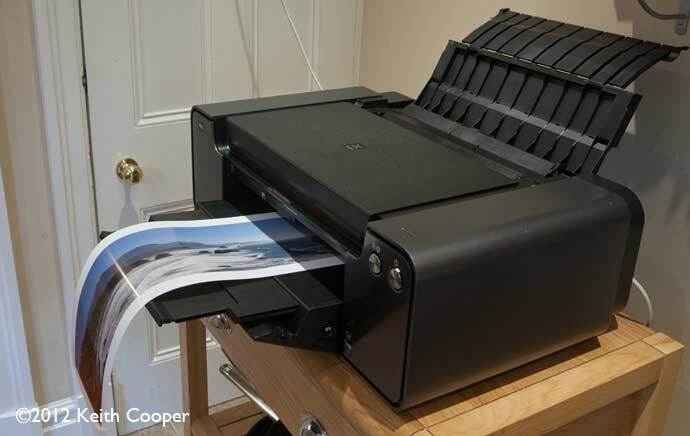 This is certainly not to say that the PRO-1 is particularly expensive, just that if you are printing a lot of images, then you really should be buying a bigger printer. Looking at the values, and how the inks ran down during testing, I’m inclined to think that these figures are not unreasonable, particularly the relatively rapid use of gloss optimiser. I see however, that the PGI-29CO cartridges are slightly cheaper to buy than the inks. It’s worth noting though that these figures represent continuous printing, and when the printer first turned up, it used up rather a lot of ink in cleaning – the message here, being not to ship printers around full of ink, particularly by normal carrier. Being of a curious nature, I weighed the ink cartridges before and after replacement. 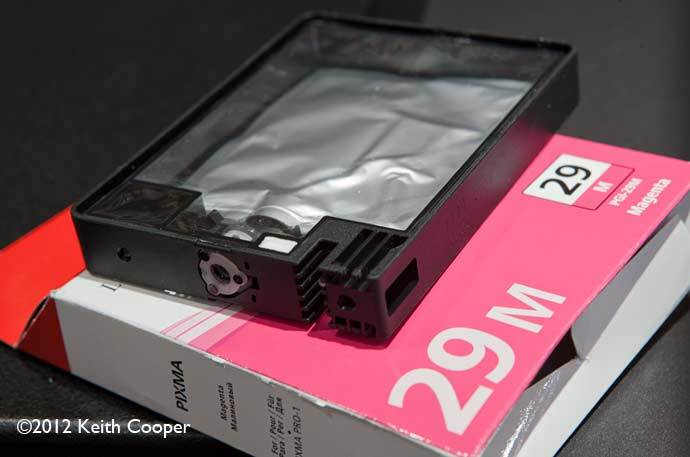 With the black cartridge I dismantled, I’d waited until the printer absolutely refused to print – there was a very tiny amount of ink in the bag I opened. 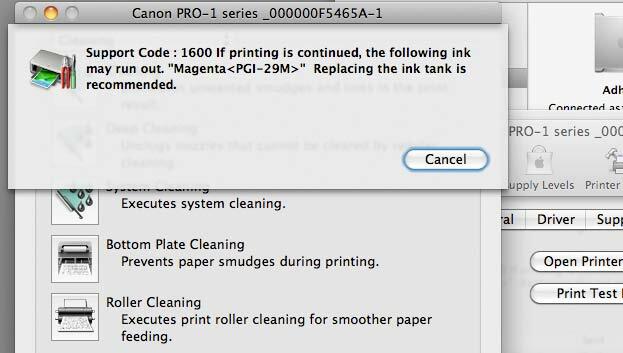 If I were unwise enough to change a cartridge at the very first ‘low ink’ warning, then almost 20% of ink was unused. Waiting until the second ‘ink may run out’ warning, still had around 7% of ink remaining. I’ve had to be careful in this review to make a distinction between the slightly battered printer we’ve reviewed and what a carefully looked after one would be like. 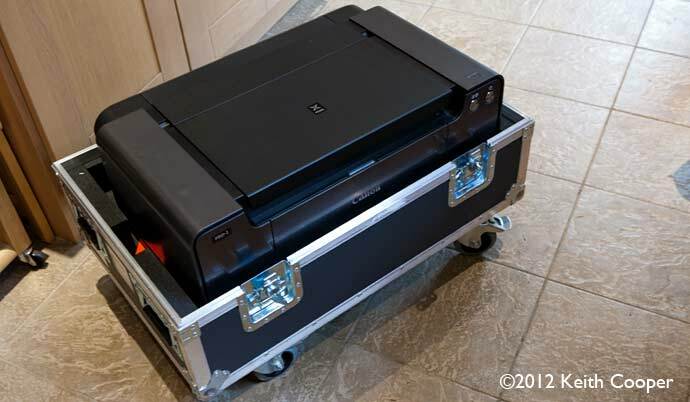 The printer is huge and very heavy for an A3+ printer – the build quality reflects this, and it’s an elegant design. With the 12 inks, print quality is excellent for both colour and black and white, on a variety of media. The gloss coating ‘ink’ effectively lowers (but does not eliminate) gloss differential issues on some shiny surface papers. 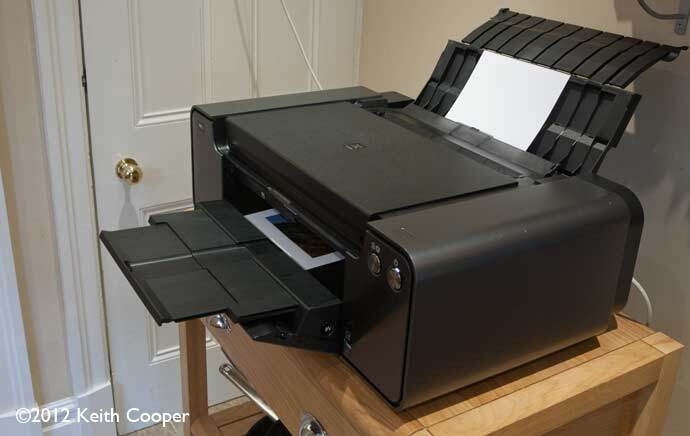 The larger ink tanks give better value than smaller A3+ printers and are easily replaceable. 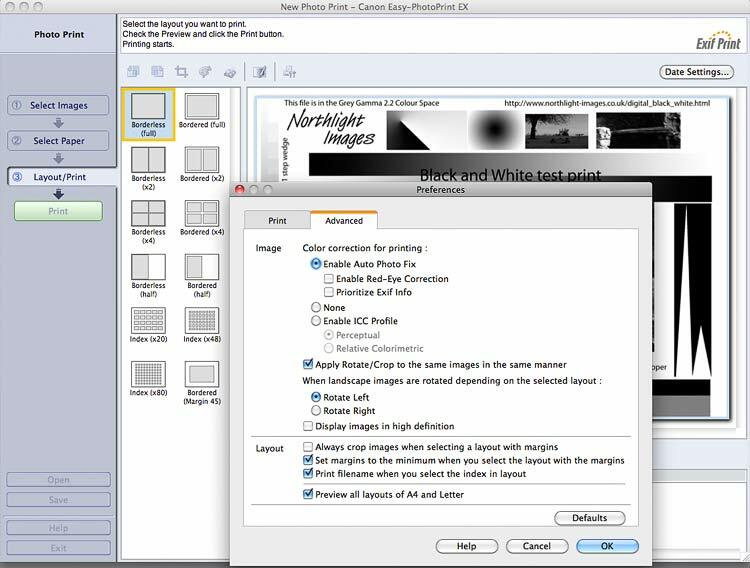 Paper size limitations and the need for a 35mm border at the start and end of some paper types may be a problem for some users. The printer also seems rather intolerant of residual paper curl at the top and bottom of pages. Update: October 2014 – Canon release a firmware update, that increases print area, canvas support and ink level detection. The details are not clear, but it does not seem to completely remove the restrictions on top and bottom margins for fine art papers or change the maximum print length. 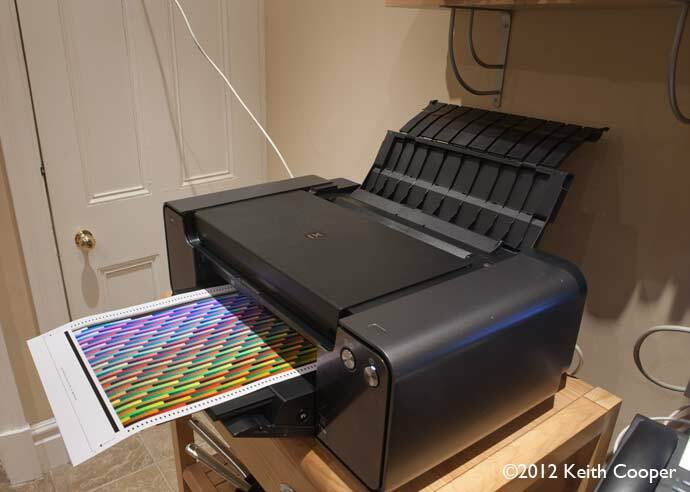 A 12 cartridge pigment ink based A3+ printer (14″ width) that produces excellent black and white and colour prints. Supports a range of media, including thick paper and printable CDs. Some annoying limitations on print sizes and margins, with certain media types. Operating Systems: Mac OS 10.3 – 10.8, Windows 2000/XP/XP x64/Vista/Win7.